Media Diversity: Economics, Ownership, and the FCC provides a detailed analysis of the regulation of diversity and its impact on the structure and practices within the broadcast television industry. As deregulation is quickly changing the media landscape, this volume puts the changing structure of the industry into perspective through the use of an insider's point of view to examine how policy and programming get made. Author Mara Einstein blends her industry experience and academic expertise to examine diversity as a media policy, suggesting that it has been ineffective and is potentially outdated, as study after study has found diversity regulations to be wanting. In addition to reviewing diversity research on the impact of minority ownership, regulation of cable and DBS, duopolies, ownership of multiple networks and cross ownership of media on program content, Einstein considers the financial interest and syndication rules as a case study, due to their profound effects on the structure of the television industry. 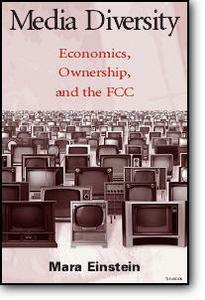 She also poses questions from an economic perspective on why the FCC regulates structure rather than content. Through the presentation of her research results, she argues persuasively that the consolidation of the media industry does not affect the diversity of entertainment programming, a conclusion with broad ramifications for all media and for future research about media monopolies. This volume serves as a defining work in its examination of the intersection of regulation and economics with media content. It is appropriate as a supplemental text in courses on communication policy, broadcast economic and media management, broadcast programming, political economy of the mass media, and media criticism at the advanced and graduate level. It is also likely to interest broadcast professionals, media policymakers, communication lawyers, and academics. It is a must-read for all who are interested in the media monopoly debate.